BESIG Annual conference is kicking off tonight, and I’m very happy to be attending this year. It started off earlier today with two pre-conference sessions. The first one was on the Future of business English training. It was hosted by Mike Hogan and started with four experts talking for five minute each about a ‘hot’ issue related to the future of BE training. Below are my notes from that session. Key question: what differences do you see with the work of the in-company trainer from when you started teaching in Germany compared to now? A couple of decades ago, companies in Germany used to offer luxurious English training for their employees, like 2 week intensive courses in a hotel. Now it’s largely a thing of the past, firstly because of the budget, but also because the level of people who come in the company is now generally a lot higher. So companies aren’t prepared to invest in pure language training any more. Other factors that James didn’t touch on are skills, profile and activities that trainers need to have. What skills does the 21st century business English trainer need to be able to cope with the demands and needs of the business English learner? Cornelia started with a list of current ‘buzz words’: work-life balance / industry 4.0 / cloud working / cloud teaching / augmented reality. We’ll need to work totally independently / keep learning / speak several languages / work together with machines (i.e. mind-machine interaction) / play more of a facilitator role teaching the students how to find things and we’re going to need hard skills, soft skills, interpersonal skills and the digital skills to keep up with the ever-changing technology and use it in class every day. We might need to teach a robot to talk. Or teach your learners to talk to a robot. Given that English is now a global lingua franca and that people are using it to communicate with non-native as well as native speakers, which type of English we should be teaching? 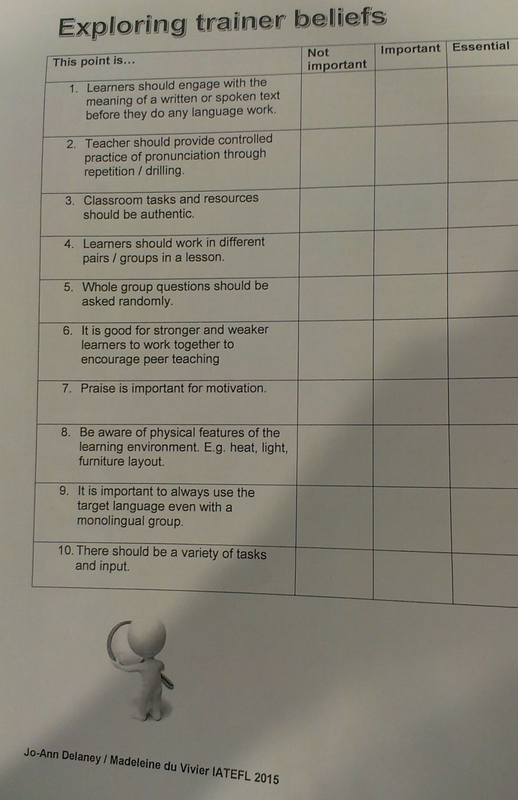 Traditionally when we teach a language, we want the learners to achieve native speaker standard. To understand native speaker humour, use native speaker colloquialisms, and speak with a native speaker accent. 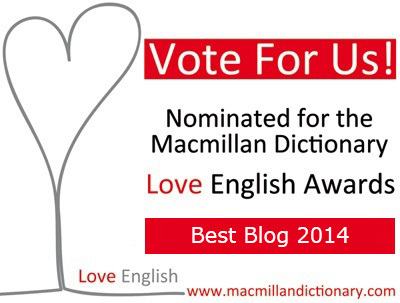 But which native speaker – the Queen? Hugh Grant? Shouldn’t we be teaching the learners to communicate intelligibly when communicating in the international arena than obsessing about reaching the native speaker standard? Chia maintains we need to give the learners exposure to a range of accents (and not native speakers pretending to be foreign), be careful with teaching idioms, especially localized colloquialism, and above all focus on the complex nature of international communication, helping the learners acquire adaptation skills and accommodation skills that will help them to become successful communicators. Given the advances in educational (and translation) technology, how do you see BE professionals maintaining relevance and adding value to their corporate clients, with specific focus on business English teaching materials? A trend towards greater specificity. We see most business training focused more on the business goals that need to be achieved by our clients. Syllabus isn’t predefined but emerges out of those goals. Accessibility. What can the company offer us as trainers and how do we handle this? What company content can we access that can help drive our tailor-made course? How do we deal with permissions and the copyright? Singularity / uniqueness. We can capture instances of how our students are communicating, like never before – including video and so on. We can reuse that to reformulate that language that they need, and the learners can use that to self-reflect. After this intro by four experts, the participants of the session discussed a range of business English training-related questions in small groups. the general feel that the need for pure language training is diminishing, partially because of new technology, and there was even speculation whether new translation technology might eventually put us all out of work. 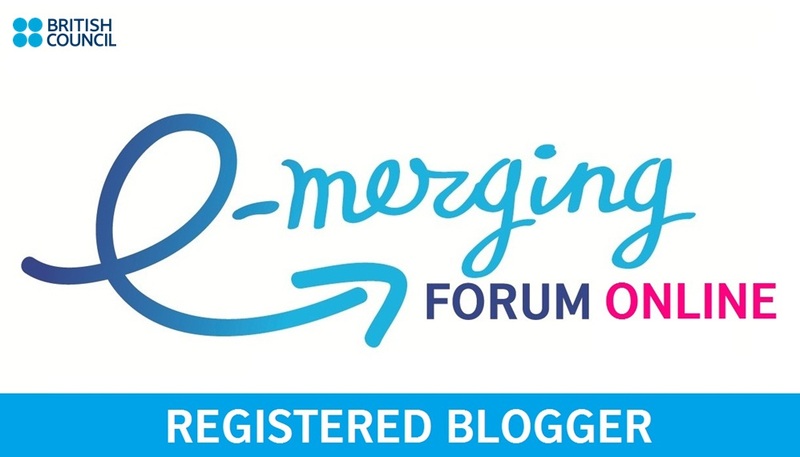 I really enjoyed this session: the intro was thought-provoking and allowed me a glimpse into business English training reality that’s quite different from mine: working in company in Russia, I do not yet feel that the need for language training isn’t there – quite the opposite, really. I also really enjoyed the interactive part of the session, as it was fascinating to get the chance to find out a bit more about business English training in a variety of countries and contexts, ranging from an in company training provider in Brazil to Swiss universities. 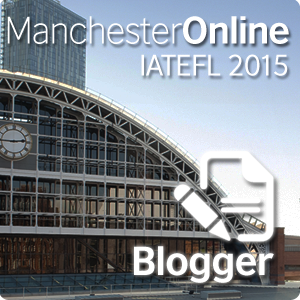 This year I was very lucky to go to Manchester to attend the IATEFL Conference. While there, I wrote up summaries of over 20 talks and workshops – I’ve decided to sort them by topic area and put the links in one post to make them easier to navigate. 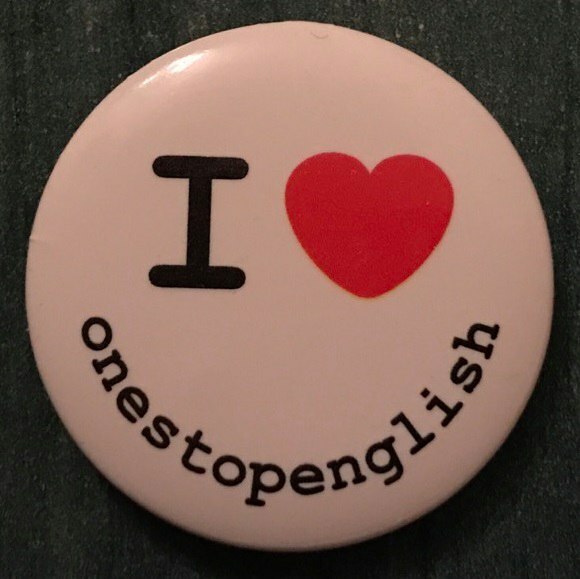 Apart from reading summaries on blogs, you can watch lots of interviews and some of the sessions that were recorded and will be available on IATEFL Online site for at least a year. I would especially recommend watching the incredible plenary by Harry Kuchah. I missed the plenary by Ann Cotton, but judging by what people who’d seen it said, this was also one of the highlights of the conference. 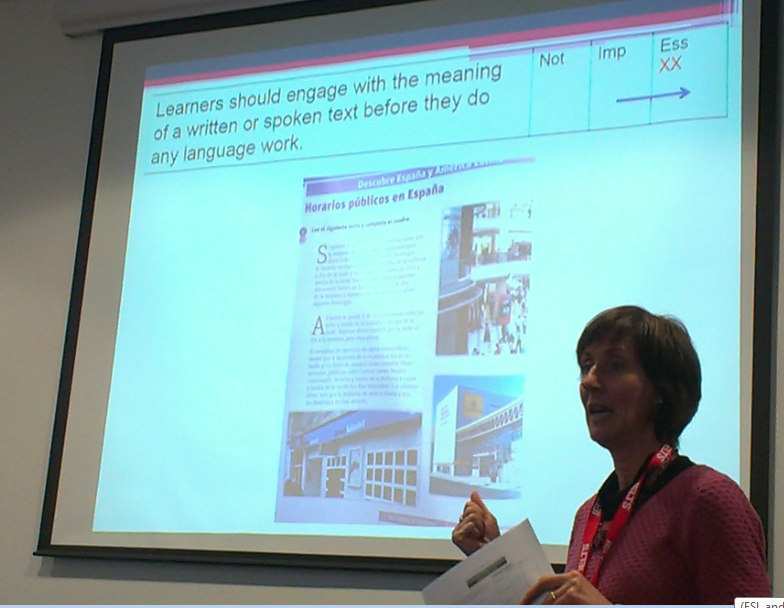 Another unmissable talk was Appropriate strategies for teaching grammar – a Dave Willis retrospective by Jane Willis. So, here are links to my summaries. Most sessions I attended on material writing were part of The Material Writer’s Essential Toolkit – MaWSIG Pre-Conference Event). The event featured eight information-packed sessions and workshops focusing on practical hands-on ideas useful for any materials writer, no matter how experienced you are. Sue Kay gives a checklist of potential pitfalls to avoid when writing multiple-choice questions and shares several very useful slides with suggestions how to reformulate language from the text in the questions. Ben Goldstein and Ceri Jones show that images can be used a lot more productively than just as a pretty picture displayed next to the text. They also share lots of image stocks where you can find different types of images, as well as tips how to navigate those stocks to get exactly what you need. Kieran Donaghy and Anna Whitcher explore the changing role of video in ELT and share lots of ideas for activity types that can be used with video content. John Hughes shares insight into writing scripts for videos, focusing specifically on the ways to make them sound natural. He also shares some techniques for making scripts interesting, referring to none other than Kurt Vonnegut and his 8 tips for writers. Material writers are writers too! Sheila Thorn, who previously produced a wonderful listening coursebook series aimed at general English students, talks about how she successfully created authentic Medical English materials in the situation when it’s virtually impossible to obtain recordings of medical interactions between patients and doctors. She also shares insight into the exercise types that students need to fully benefit from authentic listening materials. Julie Moore demonstrates how indispensable a corpus is for creating grammar and vocabulary materials – and also talks about the limitations of corpora. Evan Frendo talks about what an ESP materials writer must do before creating materials. Materials in this context will aim to enable the learners to become successful communicators (as opposed to ‘improve their language level’), and, since ‘successful communication’ means different things in different settings, materials needs to be informed by the conventions of the company/field and by top sources of difficulty in intercultural communication. Christien Lee tells us the story of his (mis)adventures in self-publishing. Along the way, he shares some very useful tips and tools for creating practice tests for high stakes exams – specifically, how to make sure that they are close in difficulty to the original tests. Nick Tims gave a wonderful, lively session in which he makes a very strong point that whenever you find yourself frequently doing a certain action in several clicks, you should find a tool that does that action in one click. He also shares some great browser extensions that allow you to control and analyze your time spent online. Paul Sweeney asked people who had created 13,000 hours of online course content between them: ‘What were the five biggest problems you faced?’ If you are starting out on the path of creating online courses, you should really read his paper when he writes it – but for now, check out the summary of this talk. Lizzie Pinard: Fostering autonomy: harnessing the outside world from within the classroom (though better read Lizzie’s own write-up of her talk on her blog). In her great talk, Lizzie Pinard shares her top seven tips for how to win the students over to the idea of practicing language outside class, support them, and really make them feel in charge of their learning, both in and outside the classroom. Kirsten Waechter talks about the dangers of ignoring the learners’ learning preferences, and shares ideas how to find out learner styles and what activity types to use with learners of different styles to really help them to learn. Madelaine du Vivier and Jo-Ann Delaney share how their language learning experience made them question their assumptions about what should be happening in classroom and made them much more aware of their learners and their individual preferences. Jason Anderson shares lots of game-like activities that involve deception, and also reflects on how ‘lying activities’ benefit learners in general, e.g. by developing higher order thinking skills and learning to adjust and read intonations and body language. This was a workshop on psychodramaturgy during which we created human statues and shaped invisible people with their lives and histories and emotions, and then became those statues and people and talked through them. It was a hopeless idea to capture that session, but it was a very different experience, so I wanted to share it. Writing this workshop up was an even more hopeless idea than writing up the workshop by Robert Zammit. We laughed (and laughed and laughed) and played and relished language. Still, maybe this post will inspire you to play too, so I’m sharing it anyway. Dita Phillips and Ella Wassell share their experience peer-coaching each other and the benefits this brought to their professional development. They share lots of tips for how to set up a similar project with a colleague you trust. Marisa Constantinides shows how she uses technology to capture and convey her lesson observations a lot more powerfully than mere notes ever could. See also Madeleine du Vivier & Jo-Ann Delaney: Lessons learned as a language learner above. Candy van Olst outlines a list of skills that skillful conversationalists employ and translates those skills into specific grammar areas that learners need to learn and practise in order to be able to have purposeful, rich conversations of the kind they might be having in their mother tongues. Chia Suan Chong shows examples of how different cultures may read different meaning into the same language and interaction patterns and gives examples of activities that language trainers can use to sensitize learners to those differences and thus help them become more successful communicators. Pamela Rogerson-Revell draws on phonological research to formulate some concrete tips for how to create successful drills, minimal pairs activities and target intonation in class. Paul Davis points out that a handful of grammar areas account for a vast majority of learner mistakes, and therefore those areas need to receive a lot more attention in class than they might currently be receiving. He also suggested some activity types to nail those slippery areas. We started by listening to examples of features of authentic speech that may cause language learners a lot of listening difficulties, even at post-C2 levels. I then show how to use free technology (youtube and Aegisub) to help learners cope with those features and share my typical listening lesson plan. In my slides you’ll find the audio and video snippets we listened to, and a link to a wide range of videos that this lesson plan can be adapted to. Christina Rebuffet-Broadus pinpoints things that freelancers often say to potential clients which hurt them by sending the wrong message, shows how small differences in the way you market your services might have a big impact on how they are perceived, and shares her experience creating value for potential clients so that they want to hear from you when you are ready to offer them a service. Lizzie Pinard wrote up over thirty sessions – indexed in this post on her blog. IATEFL online roving reporters Csilla Jaray-Benn and David Dodgson shared their impressions from about ten sessions here. Mark Hancock shared some reflections on the pronunciation sessions he attended on his blog. Abstract: In the competitive training market, it is crucial for freelance trainers to prove their added value and differentiate themselves if they want to ask for higher prices. This talk presents proven tools and techniques to do just that. We will also identify common marketing practices to avoid if you want to increase your chances for successful sales. 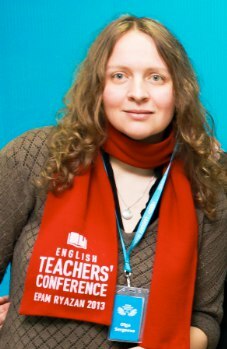 Common practices people use to mark themselves as TEFL trainers that are not very effective. Techniques to build trust and promote yourself without screaming ‘please buy my product’ – by showing them rather than telling them. Do you use any of these arguments? They all might hurt you! Formulating price in contact hours hurts you because HRs don’t take into account all the other work you have to do (lesson preparation, drawing up contracts and so on). ‘€30 per (contact) hour’ might mean that in fact you get €3 per hour. Of course it is! It’s your job to customize – everyone’s doing that so that doesn’t differentiate you. If you think of food, who has the best prices on the market? Not high quality restaurants. This is not the message you want to send out. The answer is always ‘No’ or ‘We’ll get in touch’. Asking an HR this question e.g. at a conference out of the blue scares them and this produces lizard brain reaction: ‘can I eat it?’ (no) ‘can I ignore it?’ (not polite) ‘can I run away?’ (yes, and that’s what they do). How many packages to present? Christina showed us a little experiment on how the number and prices of packages may affect your perception. The second way is a lot better because just two products at random price are difficult to compare. The point of having option 2.B is to make customers see the value of 2.C. Shops use these principles in the same way: if you see a dress at €200 you might think that’s too expensive, but when later you see a product (e.g. a bag) that’s very expensive (€1140), this anchors the customer’s idea of what’s an acceptable price for other products. Also, when you present your products in three different packages, people normally go for the middle one. This means: the one you really want to sell more should be in the middle! Presenting a discount also makes things attractive: Reg €54 > €40 is more attractive than €39. Prices that end in 9 or 7 are also more attractive. Finally, package your offers as products with names! Christina offers their clients three courses called ‘On the go’,’Half and half’ and ‘The total package’. Everything you normally do as part of the training product (needs analysis, etc) has to be listed in the product description. Build media presence (e.g. newsletters, etc). You need to be in regular contact with your marketing base to reduce the ‘lizard’ reaction. This can be done by regularly providing content that’s useful for your clients (e.g. share or create videos / share tips / e-books and pdfs). Set yourself a schedule. Christina sends out a newsletter every Tuesday – this has become part of her job. She also produces videos (ideas for what topics to address come from her clients’ typical difficulties, but she also sends new subscribers of her blog a questionnaire in which they write areas they need to practice). MailChimp is free up to 2000 subscribers. SumoMe is a plug-in to collect internet addresses. If you don’t collect the addresses of your visitors, your really have to start. They are the people who’ve heard of you and when you’re ready to present an offer, they will be willing to listen to you. Don’t underestimate the power of LinkedIn (build up your profile, create a blog, think about keywords, etc). My takeaway from this session, apart from all the great tips? In our work teachers have to perform a lot of diverse functions and we really should draw on expertise accumulated in other professional fields. Christina Rebuffet-Broadus successfully uses insights into marketing and psychology when marketing her services in the same way as John Hughes uses Kurt Vonnegut’s eight tips for writers when writing his coursebooks and Nick Tims uses technology to save himself time. Probably there are a lot more very relevant ideas to explore in books which it had never occurred to me to open. Abstract: This talk reports on a project that two experienced teacher trainers undertook to inform what they tell their pre/in-service trainees about the language learning process. We studied elementary Spanish for a term and documented our findings on a weekly basis. You’ll leave the session with practical ideas of how you can use this experience in your teaching and training sessions. As a result of their experience as language learners, Madeleine and Jo-Ann’s attitudes and beliefs about what should happen in classroom changed. They had skype discussions of their experience after each class and altogether there were about 30 things that they saw differently in the end. Also, sometimes they had quite different perspectives on what was happening in class. For this presentation they chose what they felt were the ten most important issues, so this session is a summary of key perceptions that changed for Madeleine and Jo-Ann. But first, what are your beliefs on these issues? 1. Learners should engage with the meaning of a written or spoken text before they do any language work. 2. Teacher should provide controlled practice of pronunciation through repetition or drilling. Both Madeleine and Jo-Ann felt desperate to use controlled pronunciation practice through repetitions / drilling (they even noticed other students trying words out under their breath because they wanted to try them out so much, but didn’t get enough opportunities in the lessons). 3. 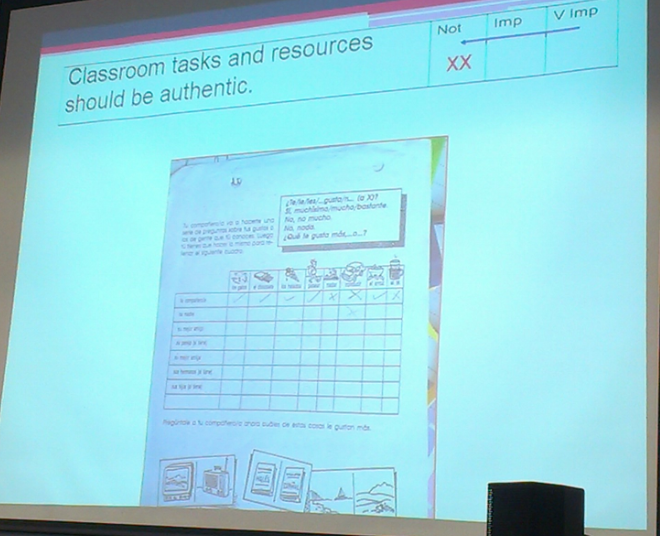 Classroom tasks and resources should be authentic. 4. Learners should work in different pairs / groups in a lesson. Not Imp >>>>> V important. Both Madeleine and Jo-Ann really recognized the value of re-grouping students. They got incredibly bored sitting next to the same person. 5. Whole group questions should be asked randomly. What they mean was checking answers to exercises: should the teacher nominate random people, or use a predictable pattern of nomination? Madeleine: Not imp >>>> V imp – she wanted to prepare her answer and really didn’t want to be put on the spot. Jo-Ann: V imp >>>> Not – she felt predictable patterns were bad for her learning missed questions 1-5 because she would be number six. 6. It’s good for stronger and weaker learners to work together to encourage peer teaching. Madeleine V imp >>>> Not – she wanted to work with same level or lower to feel safer. Jo-Ann: ‘explaining helps you’ is rubbish. I want to learn, I don’t want to explain. 7. Praise is important for motivation. Jo-Ann Imp >>> V Imp. Before taking lessons, Jo-Ann thought it’s not that important and she had a worry that sometimes teachers overpraise. But when she had ‘Fenomenal!’ on her writing, it had enormous impact on her motivation. When she came to work, she couldn’t stop talking about it and worked really hard to get that again. 8. Be aware of physical features of the learning environment. E.g. heat, light, furniture layout. Madeleine: Not >>> V Imp. Before the experience, Madeleine hadn’t realized how much being uncomfortable would affect your learning. You should really think about how the classroom is laid out and the temperature. 9. It’s important to always use the target language even with a monolingual group. Jo-Ann: V Imp and stayed that way (the classes were 99% in Spanish and Jo-Ann really valued that). Madeleine: V Imp >>> NOT. She wanted more English because she didn’t understand grammar explanations. 10. There should be a variety of tasks and input. Madeleine Imp >>>> V Imp. Jo-Ann – wasn’t an issue. Other issues included listening – too fast and the teacher didn’t play them enough times; the amount of time spent on correcting homework in the lesson, etc. The experience (and the fact that they had different attitudes to what was happening in classroom) made Madeleine and Jo-Ann more aware that they need to question their assumptions. They became more aware of their students (and, for Madeleine, especially their comfort). 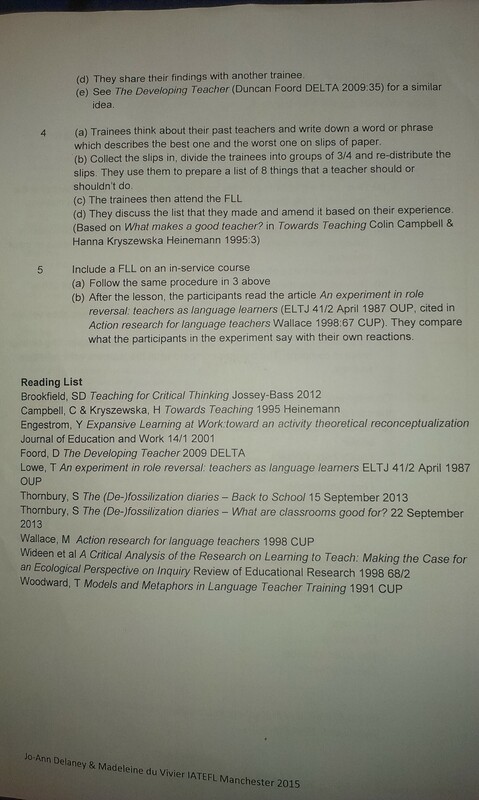 Here’s the handout that Madeleine and Jo-Ann shared (the last page comes from The Developing English Teacher by Duncan Foord). Scott Thornbury, The (De-)Fossilisation Diaries. This session was one of the ‘unmissables’ for me, because I’m very interested in lessons that teachers draw from their language learning experience. It was also quite surprising: I had expected the presenters to talk about some aspects of language acquisition or learner strategies, because those were the kinds of takeaways I drew from my own recent language learner experience (I was teaching myself German and also took two dozen Dogme-type skype lessons). But Madeleine and Jo-Ann’s experience was in a class, so it was a lot more similar to that of their learners, and their top takeaways were about classroom management and the teacher’s decisions. Two most important things I took away from this talk was (1) it’s extremely important to survey students’ perceptions about 5 lessons into the course (2) things important for the students might be things that have never occurred to me – so it’s important to make sure that feedback I get isn’t too focused – e.g. simply a questionnaire might be a poor choice. Abstract. Many Business English teachers often worry about their knowledge (or lack thereof) of the business world. But aren’t we already well-equipped as language practitioners to understand the delicate and ever-so-interesting nature of discourse in business and how it differs amongst different speech communities? This workshop explains how we can use these instincts to help our clients become more successful communicators. The title says ‘pragmatics’. What is it? The way meaning of an utterance is negotiated by people in the context. Terms: utterance (the words that were spoken); locutionary force (surface meaning of the utterance); illocutionary force / function (the intended/negotiated meaning of the utterance). The function here is probably ‘advice’. What are the functions here? How do you know that these two utterances are even connected? The listeners make Tom’s answer relevant through making all kinds of references. But imagine the listener is from a country with no internet or no trains? exponents that aren’t synonymous but which are labeled under the same category. Some functions, at least on the surface, lend themselves to such categorization (e.g. with requests / commands). However, language is difficult to categorize – e.g. the examples below were presented in one coursebook together labeled as ‘praise’, But the intentions of people who use those exponents are probably very different. I don’t mean to brag but..
(Adapted from Prof. Henry Widdowson). However, what could they mean in context? Beth: We are totally underpaid, the offices are overcrowded, and the directors are completely out of touch with the staff. Having said that, I do love working here. (implies ‘I’m just venting‘. Compare what happens if you substitute for ‘But then again?’ implies more equal weight). Implications: the simple categories are not enough. There’s really meaning in everything. Illocutionary forces. What do the following utterances really mean? That is a very brave proposal (you’re mad). The fact that there’s meaning in everything may create great difficulties in intercultural communication, when different people read different meaning into the same words / behaviour patterns / body language etc. What is the context? Who are Sarah and Aki? What does Aki really mean? Sarah: We could inject another $50k for 15% of your business. ‘That’s interesting’ might mean ‘I need to think about that’ or ‘I need to discuss that with my boss‘. However, in Japanese ‘That’s interesting’ means no’ (and Chia Suan Chong has never heard the actual word ‘no’ in Japanese). How would you reply to those greetings? Hello! How are you? > Fine! Yourself? Lovely weather today. > Gorgeous, isn’t it? That is a gorgeous dress you have on! > Oh, this old thing? I’ve had it for ages! How’s your wife and children? In some cultures they are standard greetings (and require standard responses). In China, you have to say: fine/yes to all of them (when used as greetings). E.g. if you reply ‘no’ to ‘Have you had lunch?’ I’m obliged to bring you up for lunch. Implications: the need to attune to the culture of the other person. Example 3. Formulaic responses that draw on cultural inferences. Deb: Is the meeting going to overrun again? Rachel: Is the pope Catholic? Sandy: What did you think of their new offices? Josh: Well, the carpet was a nice colour. Lucia: Did you understand his explanation? Steve: It wasn’t exactly rocket science, was it? Allyson: You won’t believe what happened to me today! Allyson: Right, if you’re not interested, then I’m not going to tell you! in her culture, it was impolite to interrupt. 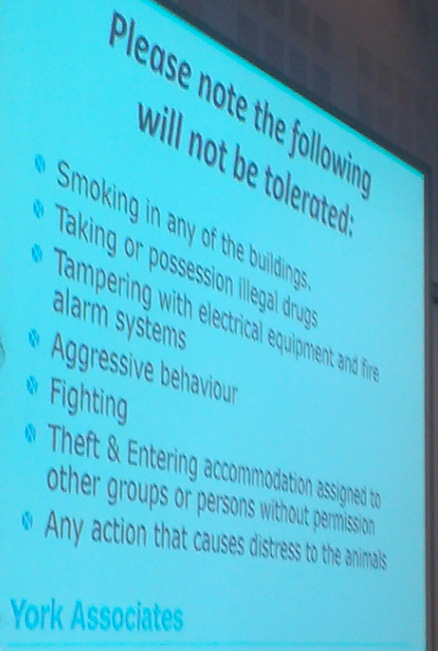 Students who received this notice were very offended because in their culture, this handout would be an accusation – it read like ‘you ARE going to smoke and take illegal drugs; you ARe going to tamper with electrical equipment, behave aggressively and fight’ etc. We’ve established the need to attune to the culture of the other person. But: you can’t accommodate what you don’t see. Students work in pairs. Student B has a task and a secret emotion. They should talk with that emotion; Student A guesses the emotion. Activity 2. Hot Seat + idiosyncratic behaviour. Trains s/s to become sensitive to idiosyncrasies and accommodate them. Such activities help to ground real-life situations where things are not what they appear to be. 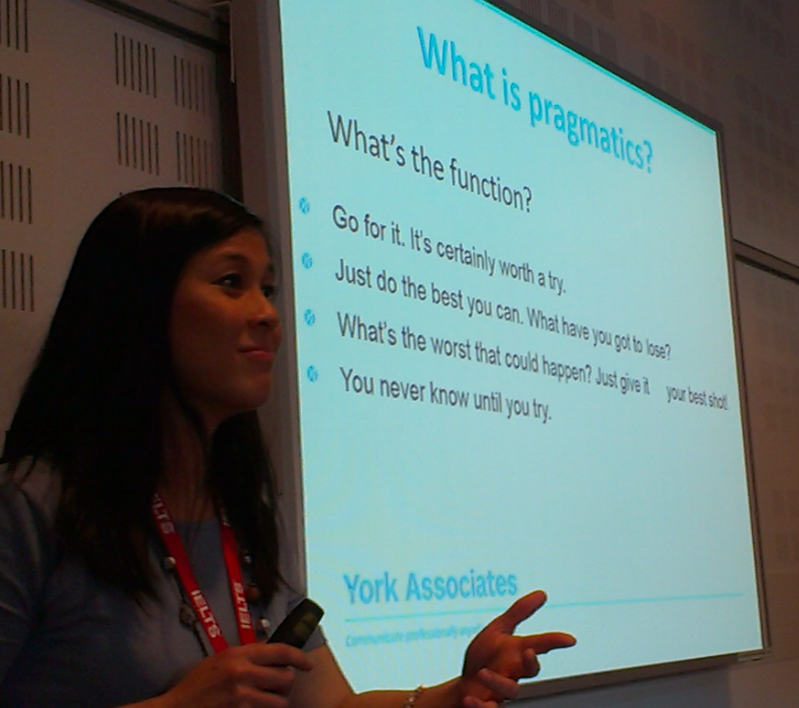 An incredibly useful session – I especially loved that it was so practical. Lots of examples that can be brought to class, and great activities. I teach in monolingual context so the first activity probably needs to be adapted – I think I’ll start collecting film scenes where characters project strong emotions, e.g. boredom with the conversation, envy, etc. I think activity 2 is also ideal for practicing interaction patterns that are different between L1 and L2 – e.g. for Ru/Eng that would be backchanneling, using expressions like ‘Well’ and ‘Right’ and so on. Abstract: “I’m not creative”, “I hate role-plays”, “I’m not spontaneous”; a common reaction to the roleplaying activities offered in many a classroom. Using techniques and methods from PDL (psychodramaturgy for language acquisition), we’ll see how easy and fun it can be to set up role plays that feel authentic, using nothing but the resources every teacher has – the participants. This was a great (and very unusual) workshop in which we created human statues and shaped invisible people with their lives and histories and emotions, and then became those people and talked through them. I’m not really sure whether it’s possible to make a write-up of this workshop. Can one write up a theatre performance? A game? Written down, will the questions that Robert asked us sound right? But it was a very different experience, so I will try to share some impressions. Follow-up: Now open your eyes, say hello to the person next to you and talk (being that person you’ve imagined). Regarding the second part – the conversation – we got stuck a bit, mainly because we didn’t know where we were supposed to have that conversation. I think setting up the scene would’ve helped. Next, we started playing ‘human statues’: participants get into groups and one volunteers to be a ‘marionette’. The others pull them by invisible strings – changing the gestures, creating a smile – or a grimace, moving them, etc. There’s only one rule: if someone did something, you can’t just undo it, e.g. put the marionette’s hand back, etc. But you can develop other people’s actions. Follow-up: Two participants who were statues from different groups face each other, get into the position they were in at the end, say something and see what happens. Sometimes they have a whole conversation, sometimes it’s just a two lines – that’s fine. Participants sit in circles in groups. There’s one empty chair. There’s an (invisible) person sitting in it. Your group decides – who is this person? Again, you can’t undo what someone has said! Be careful, if you say ‘It’s a hundred year old blond prostitute’, you’re stuck with it! Start with simple things: is it a man of a woman? What do they look like? Comment: I wrote up the first half of our group’s conversation, because I wanted to see what language and interaction would come up. Here it is (new lines represent a new person speaking). It’s a she? She looks a bit old. Like, grey short hair? Glasses? I think she’s got beads. IT’s made of something like… pearls but very big. I think they’re made of wood. She looks a bit nervous, I don’t know why. She checks her watch. Maybe she’s waiting for someone. Maybe she’s waiting for her lover or something. I think though that she’s going to tell him that being a religious woman she can no longer cheat on her husband. Follow-up: One of you is going to sit in that chair and become that person. Do we have a volunteer? Have this person take that role by asking questions. Start by asking the questions that you know answers for to help them to get into the role – but then new questions will come up. In this position you’re always entitled to say ‘no comment’ or ‘I’d rather not say’. When volunteers were in their chairs, Robert first asked them to say their new names. ‘Rachel, you’re going to meet Alice. And the rest of you sit behind. You’re assistance – they can support you with ideas, but they’re also linguistic supporters. At any time you can turn back to them and ask: what the hell am I supposed to say? (Have a look at the photo on this page to get a feel of what this looked like). Where does linguistic input comes in? The technique that Robert demonstrated next, reminded me of Community Language Learning. To make the experience more vivid, he demonstrated the technique as if we were learning Italian and Maltese (it’s difficult for English speakers to experience an English lesson). Robert asked Alice, ‘Can you think of one thing that you wanted to say to this person’ (in her L1)? A: I’m very happy to meet you here cause I was feeling a bit lonely. R: I’m going to sit behind you and I’m going to say what you said in Italian, and I’m going to say more. And you repeat what I say. R: Que bello. //Quite long monologue followed, with Alice repeating utterance by utterance. 1. If it was an English language classroom, would the participants be proficient enough to build a personality? Robert has tried this with beginners – they cope, they can always code switch (ask for vocabulary). In the last activity, he adjusts what he says depending on what she can repeat – following the learner! The principle is: create the desire to say something; then say it; and after, they repeat. 2. A question to the person who was repeating utterances in Maltese: how did it feel repeating things you didn’t understand? Comment: it’s stressful. The trainer might have to say the utterance 2-3 times before they can repeat. Tip: get them to look at your lips. 3. It’s almost impossible to speak Maltese without gesticulating. So, you (the trainer) were speaking with your hands but she couldn’t see your hands. Comment: There are a range of different activities. They also worked a lot with hands – lots of exercises where you have to mirror what T does. The whole point is going from the physical aspect to linguistic. 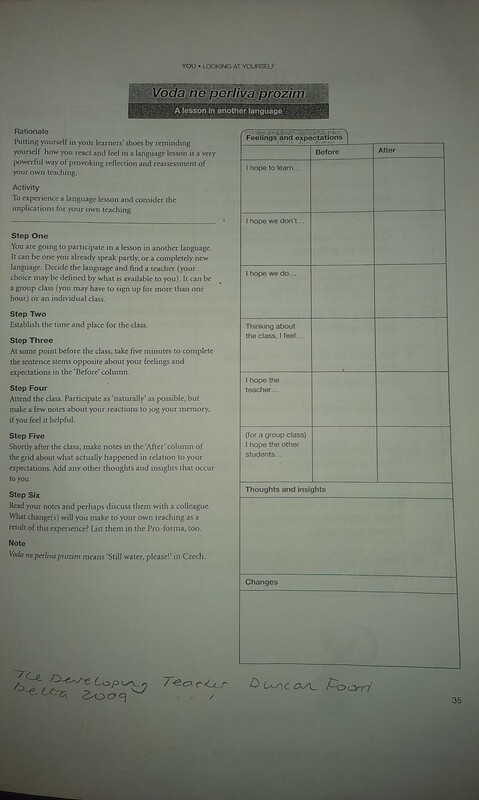 Final notes: Robert tried this with most of his groups, in different contexts, including Business English. One great experience was when they did an intensive weekend of this work with beginners. By the end they all could understand: had basic vocabulary and understood words. When Robert wrote them a follow-up email, he realized that he didn’t even have to translate it. Often in coursebook you get the task, ‘Speak about your hobbies,’ but it’s impossible to start speaking. Using the techniques Robert showed, because you help the person say what they want to say, they’ll remember it. Comment from Paul Davis: he has been using similar techniques too. 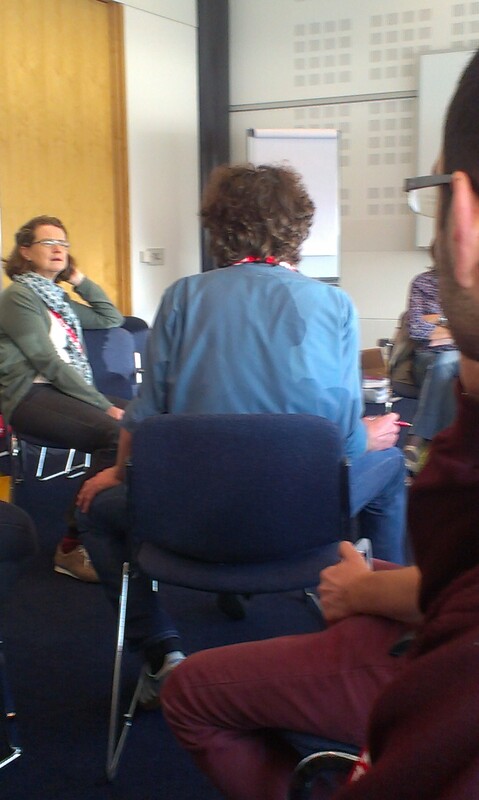 In multilingual groups where you can’t use translation, participants try to say something and he elaborates it. Also, Paul Davis thinks that it’s ideal for ESP. He did this with medical groups. Half of them were bacteria and half of them were viruses and they argued. Or half of them were scalpel and the other half cancer. One sentence summary. This is pedagogy of being: your participant is an individual human being, and if you respect that, they will want to say something. A very interesting session.I don’t think I’ll have the courage to bring this to my Business English class, but I might try it as a fun evening event in my school. P.S. While I was googling pictures and videos for this write-up, I found another great workshop on integrating improvisational theatre activities in the business classroom by Christina Rebuffet-Broadus at IATEFL Hungary. And this one actually was videotaped! Really enjoyed watching it.